Obviously not my car, but I'm too lazy to go outside and take a picture of it. It's a 2000 LX 470. I love it to death. I've had it for only 13 days and I have already put 1000 miles on it. I have driven many supercars, but I think that this car has to be at the top of my list. It's so rugged and utilitarian. Working on this car is such a joy. I was fixing a couple of things with my dad over the weekend and I could've done it in the desert or in the tundra. I hope to keep this car till my son is born (which is like a long time away). I honestly don't know why I didn't get one earlier. It seats 7 people easily. It is super comfortable. It's the ultimate Jalop car. 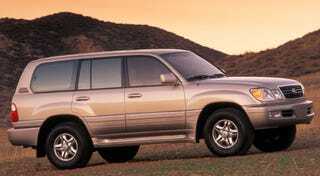 When buying one, if luxury comforts don't appeal to you, then get the Landcruiser. If you do like the luxury features, then I suggest the LX. Try to find something that is from the South or the Southwest. Many you'll find that have rust. Mine has rust, but its whatever. Mine has 176k miles FWIW and it runs amazing. Just please buy one or take one for a test drive.